Airfares from Los Angeles to Australia are often under one thousand dollars on most airlines. And with the airlines constantly upgrading their products and services to court both leisure and corporate travellers – it’s passengers who are reaping the rewards. Here’s a list of the airlines that fly between the USA and Australia. Australia-wide domestic connections meet with Virgin Australia’s daily departures to Los Angeles, from Sydney, Melbourne and Brisbane. With three cabins to choose from, each cabin is famed for the Virgin Australia service and unique touches. Virgin was also the first airline to introduce Premium Economy between Australia and the US. With a cabin refresh in 2016, Australia’s second-largest airline is high on service, yet low on fares. Connections can be made from Los Angeles and beyond with code-share partners, offering daily connections throughout the US, Canada, Mexico and the Caribbean. Australia’s largest airline, and the second oldest airline in the world, Qantas offer multiple daily flights between Australia and Los Angeles, San Francisco, Honolulu and Dallas. With code-share partner American Airlines, flights throughout North America and the Caribbean are available daily. With four cabins to select from, the flying kangaroo has the most daily flights between Australia and the USA. United Airlines has been flying to Australia since the early 1980’s, after purchasing the flying rights from Pan Am. Well established on the route between Los Angeles and San Francisco to Sydney, plus Los Angeles to Melbourne, United’s hub at LAX places it well to connect to cities throughout all of North America. United fly an all 787 Dreamliner fleet to Australia, which reduces seat capacity while improving the customer experience (read our story on United’s upgrade here). With code-share partner Virgin Australia, Delta flies daily between Los Angeles and Sydney with connections available throughout North America. Although only two cabins are available for sale, economy and business, ‘Economy Plus’ is an additional option for a fee in economy, or free to reserve seats for higher tiered frequent flyers. Placed at the front of the cabin, a few extra welcomed inches of legroom are available, although all seats and service are still standard economy (a new, refreshed cabin is coming soon including Delta’s new Premium Economy cabin in 2019). With Delta’s large hub at Los Angeles Airport, connections throughout North America and the Caribbean and Canada are easy and seamless, with Australian domestic connections with partner Virgin Australia. A man sleeping in Delta One on an Airbus 330-300 (333). – These images are protected by copyright. Delta has acquired permission from the copyright owner to the use the images for specified purposes and in some cases for a limited time. If you have been authorized by Delta to do so, you may use these images to promote Delta, but only as part of Delta-approved marketing and advertising. Further distribution (including proving these images to third parties), reproduction, display, or other use is strictly prohibited. Delta Comfort+ seats on a Boeing 757-200ER (75S). – These images are protected by copyright. Delta has acquired permission from the copyright owner to the use the images for specified purposes and in some cases for a limited time. If you have been authorized by Delta to do so, you may use these images to promote Delta, but only as part of Delta-approved marketing and advertising. Further distribution (including proving these images to third parties), reproduction, display, or other use is strictly prohibited. Heavenly bedding in Delta One on an Airbus 330-300 (333). – These images are protected by copyright. Delta has acquired permission from the copyright owner to the use the images for specified purposes and in some cases for a limited time. If you have been authorized by Delta to do so, you may use these images to promote Delta, but only as part of Delta-approved marketing and advertising. Further distribution (including proving these images to third parties), reproduction, display, or other use is strictly prohibited. The newest airline to fly the highly competitive Los Angeles to Sydney route is American Airlines. Launched with code-share partner Qantas, the daily 787 flight offers two cabins to choose from. As the world’s largest airline, American offers connections throughout North America from their hub in both Los Angeles and Dallas. Onward flights within Australia are with partner Qantas. Hawaiian Airlines has daily flights Honolulu to Sydney, with several weekly flights between Brisbane and Honolulu. Hawaiian has one of the more generous economy class baggage allowance, with 32kg of checked baggage per passenger (approx. 70lbs). A refreshed cabin to both economy and business class cabins should grow customer satisfaction with the new service and cabin promises. While considered a full-service airline, Hawaiian Airlines do not offer the traditional international inflight service passengers would expect to Australia, opting for a domestic USA inflight service instead for meals. Be sure to eat prior to departure or take food and snacks onboard with you as the basic service onboard is only one meal choice (Hawaiian chicken) and no vegetarian or other options. The low-cost Qantas off-shoot is a no-frills operator from Sydney, Brisbane and Melbourne to Honolulu. Sporting an all-new 787 Dreamliner fleet, with economy and business class (although business class is more premium economy), this a-la-carte style airline offers low fares year round with passengers only paying for what they need including meals, entertainment, blanket packs and baggage. Jetstar‘s domestic routes, and big brother Qantas’ domestic network connect travellers to Sydney, Brisbane or Melbourne. 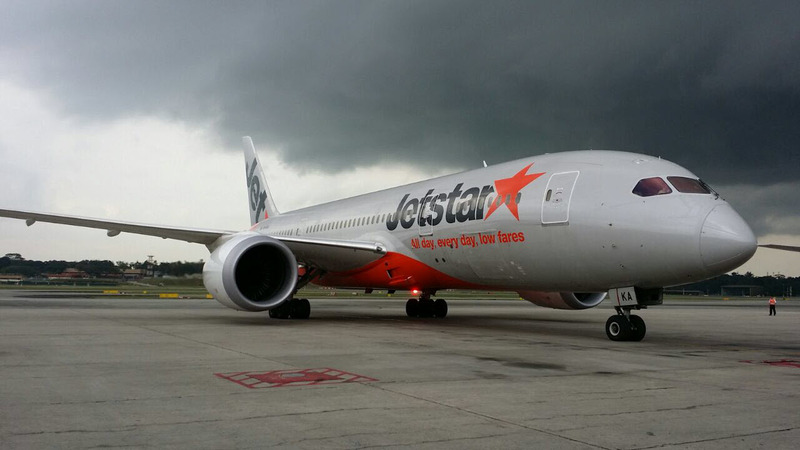 Note – 2016 will see Jetstar dropping their non-stop Brisbane to Honolulu flight.